EVOline is the acknowledged master of high tech executed with superb design skill. The EVOline Port Push is one of those ideas that makes you wonder why no one thought of it before. 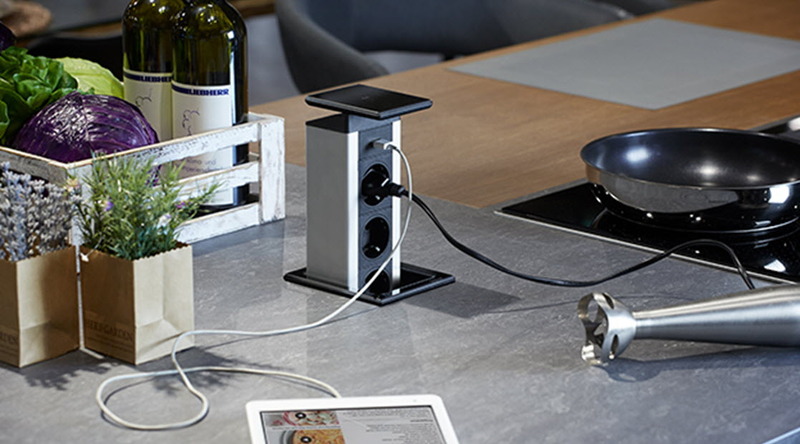 The Port Push replaces bulky extension cords, cable tangles, and intrusive sockets. 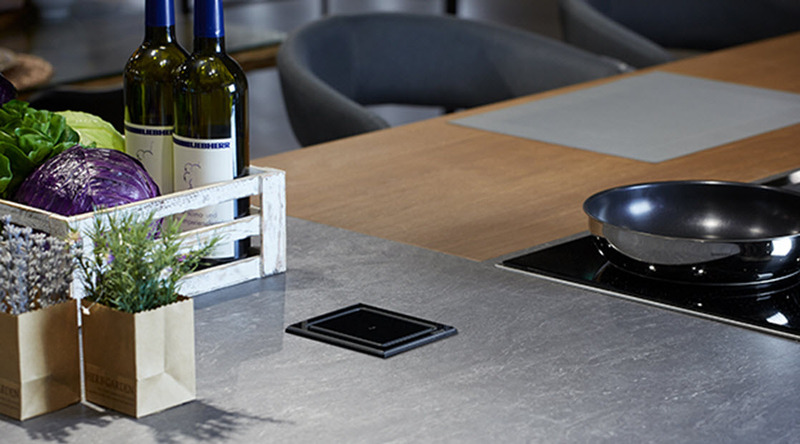 When you don’t need it – it’s tucked away below the surface, giving you a perfectly flat desk or worktop with a thin plate set into it. When you do need it – one push and the unit rises up above the worktop on a soft-slide mechanism. It’s really an iconic design and brilliant functionality. You can now connect power, USB, data and media cables as needed. What’s more, the connection modules inside the Port Push can be swapped around, depending on your requirements. The unit has a light-touch close, with all the cables securely connected inside it. Kitchens are often the center of the home. Here is where people want to watch TV, listen to music, charge their phone and tablet, or even keep an eye on their email. All that while they prepare a meal. In fact, smart kitchens are the latest trend. The raised position of the Port Push means that plugs and data cables aren’t getting water splashed on them. It’s hygienic too because when the port is not in use, you can wipe it down when you’re cleaning the rest of the worktop. It’s safe, even if a few drops of moisture sip into the unit, the vertical placement ensures that contact points stay dry. Even when larger amounts are spilled, grounding protection will kick in. And another bonus – there are no more trailing cables that can trip up children, or that the dog can walk into. Resulting in your new laptop ending up on the floor with a cracked screen. 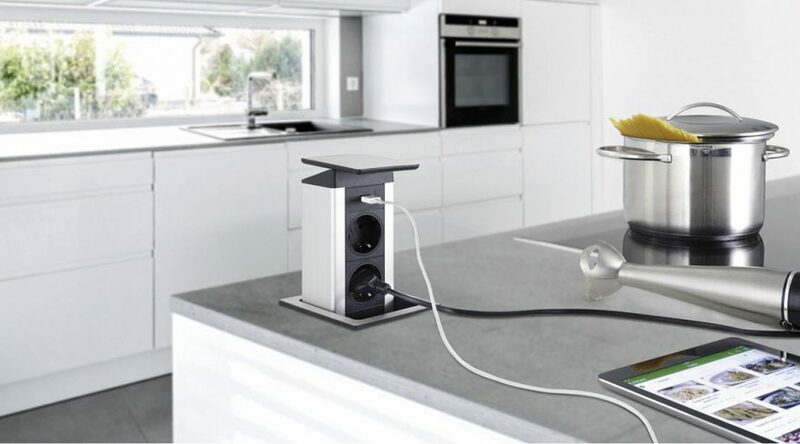 Effectively, it means that you can have sockets wherever and whenever you need them. Simply push them back down when you’ve finished with them. If you’ve installed a modern office, and want technology to match, you’ll love the latest EVOline designs which perfectly complement contemporary environments. There’s a version with a stainless steel cover, with a hard-wearing aluminum housing inside. And now there’s also the height of cool – a high gloss, black glass version and also a satin finish, white glass inlay. If your needs change, you don’t have to install something different – you can simply remove the data- or multimedia module you don’t want and replace it with a different one. For example, you can replace an unused USB 3.0 module with a USB 3.1 version. There’s also a great selection of different data cable, USB and multimedia connectors. EVOline also offers personal and customized solutions to customers, businesses, and public services worldwide. Don’t just take our word for it …. 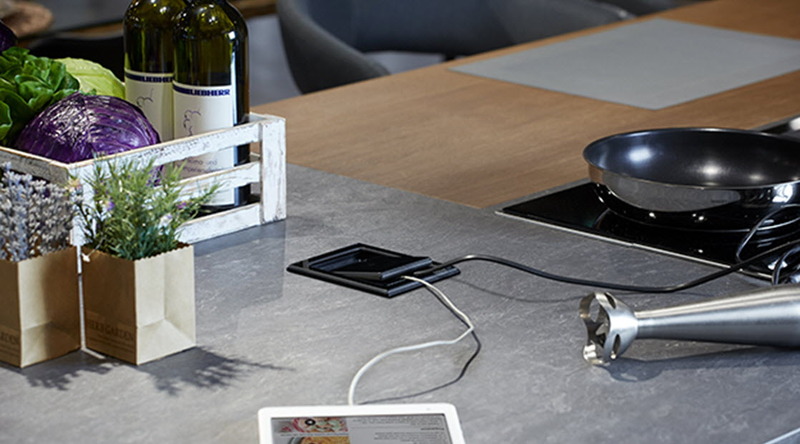 The EVOline Port Push has scooped numerous awards for its design. The prestigious Iconic Awards are sponsored by the German Design Council and offer a very hotly contested award for the most iconic new product. The Push Port’s sleek combination of great functionality and cutting-edge design scooped this year’s prize. Or maybe you like to design your own EVOline Port Push? The push port from evoline exceeds expectations.